Although the oldest extent large-scale stained glass windows are in the German Cathedral in Augsburg, it is the Abbey Church of St Denis, near Paris, which marked the real revolution which was to sweep Europe in architecture and glass. 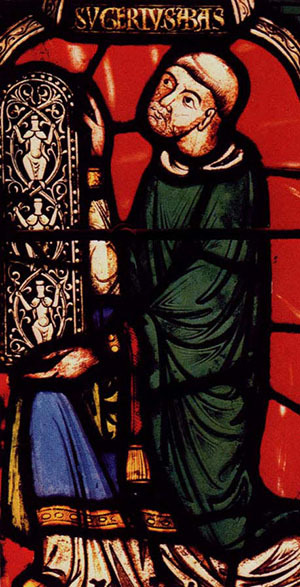 From 1122 to 1151 the Abbot Sugar served the Abbey of St Denis and the French Monarchy. It was he who visualized a radical change in what churches should feel like. Up to this point the ever-growing congregations were housed in ever larger structures built tall and wide by using immensely thick walls to support heavy roofs. This left very little room for windows and produced gloomy darkened “Romanesque” cathedrals where hell,fire, and damnation were the constant subjects of sermonizing. Abbott Sugar intended something quite different…He wanted to concentrate on the positive aspects of redemption. atonement, and eternal life. Walls of colored light would illuminate the new cathedrals and the spirits of congregations. In addition, these new colored glass images could tell bible stories. So it was the driving force of how to build thin walls holding sheets of colored glass that eventually led to such architectural embellishments as flying buttresses. For the first few hundred years of this extraordinary early period brilliant sparkly glasses were produced which dazzled the eye. As the centuries progressed, however, the fashion got more and more elaborate in terms of painting on the surface of the glass until the works created in the 17th,18th, and 19th century became rather dull and lifeless. Over-painting was producing dull glass with little fire or life of its own. Enter Louis Comfort Tiffany and John LaFarge near the turn of this past century – 1900 – two artist experimenters who wanted to do something significantly different in glass. They both wanted to create works as painterly as possible – they wanted to have the color “in the glass,” not on it. 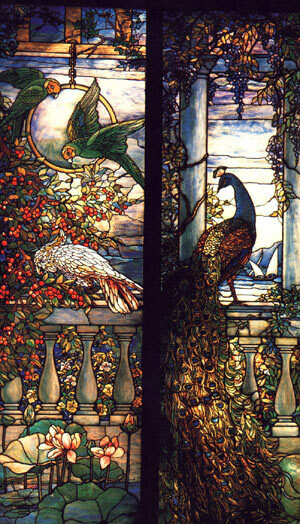 Louis Comfort Tiffany, especially, had the means to have his own glass foundry after originally getting most of his early glass from the Kokomo foundry in Indiana. Some of the results of this experimentation at the Tiffany “favrile” factory that took place over the early 20th century years can today be seen in the MORSE MUSEUM in Winter Park, Florida. Glassworks today include all of the techniques pioneered in these two revolutions. Nearly every glass first created at the turn of the century is now, once again, in production. And what is more important, new ones are being introduced. We may well be on the verge of the third revolution in stained glass!